Playing music in your home is not just great for parties, but for relaxing yourself and other guests throughout the year. However, having to stay in one room to enjoy your favourite tracks just doesn’t compute with modern living. 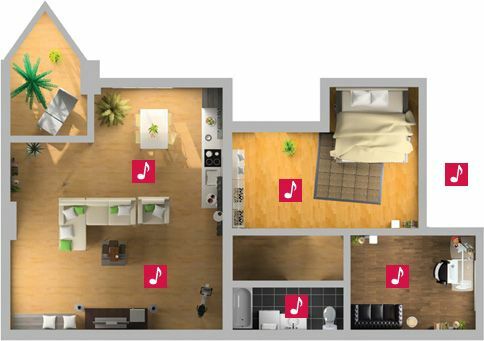 That’s why multi-room AV and being able to seamlessly stream tunes from room to room is now a necessity for any home. By pairing your AV system to all smart home technology you can decide where, when and how you enjoy entertainment in your house. Audio-visual systems come in all shapes and sizes, so our experts will always come out to your home to map out a bespoke design for you. We stock only the very best equipment and endeavour to squeeze the most out of any budget given to us. Our AV specialists are experienced in building discreet installations in keeping with your home’s interior features, ensuring that your new system sounds and looks great too. Give our friendly team a call on 01622 676703 or drop by the store for a visit.